THIS PORTABLE TABLE SHIPS BY FED EX GROUND, ALL SHIPPING CHARGES ARE EXTRA, THESE SHIP CHARGES WILL NOT APPEAR ON YOUR INTERNET ORDER BUT WILL APPEAR ON YOUR INVOICE RECEIVED FROM US. Key Features: • Smooth, reliable electric lift actuator • ADA Compliant • Rounded Corners • Heavy Duty Steel Frame • Natursoft™ Upholstery – 100% PU in sixteen colors • Pro-Plush™ Deluxe 3-Layer 3” Cushioning System • Wheels For Ease Of Movement • Easy to use foot pedal • Made in the USA with components sourced globally Pneumatic Tilt Options • Non-electric – uses economical pneumatic assisted lifting system. • Enables expanded services including facials, medi-treatments and more. • Earthlite’s proprietary One-Touch™ Levers offer pneumatic assisted back and leg adjustments even while client is on the table. • Easy and infinite adjustments. THIS DOES NOT SHIP FED EX OR UPS GROUND.“ ALL SHIPPING CHARGES ARE EXTRA,“THESE SHIP CHARGES WILL NOT APPEAR ON YOUR INTERNET ORDER“ BUT WILL APPEAR ON YOUR INVOICE RECEIVED FROM US. Our Ellora™ Salon electric lift table is designed for comfort, long-lasting reliability, easy care, and great performance. Ideal for a variety of treatment services, this table is a superb value. Available with pneumatic or electric salon top. Optional accessories package includes: Neck roll with straps, salon pillow, and flexible sidearms. THIS STATIONARY TABLE MUST SHIP BY TRUCK ON PALLET SO THAT IT DOES NOT GET DAMAGED. THIS DOES NOT SHIP FED EX OR UPS GROUND. ALL SHIPPING CHARGES ARE EXTRA, THESE SHIP CHARGES WILL NOT APPEAR ON YOUR INTERNET ORDER BUT WILL APPEAR ON YOUR INVOICE RECEIVED FROM US. Crafted from beautiful Hard Maple, the Sedona stationary table comes standard with manually adjustable legs, sturdy hardwood frame and a luxurious, rounded corner flat top. 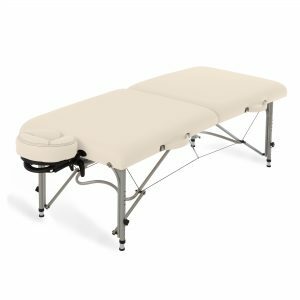 Generously upholstered with our Pro-Plush™ Deluxe 3” cushioning system and covered with our sumptuous yet durable Natursoft™ upholstery, the Sedona Series provides beautiful and affordable treatment table options for a broad range of customers. Shown with optional headrest. Crafted from beautiful Hard Maple, the Sedona Tilt stationary table comes standard with manually adjustable legs, sturdy hardwood frame and a luxurious, rounded corner flat top. 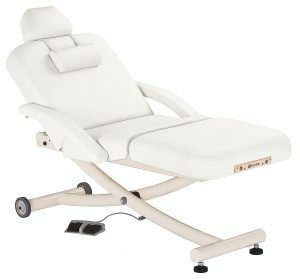 Generously upholstered with our Pro-Plush™ Deluxe 3” cushioning system and covered with our sumptuous yet durable Natursoft™ upholstery, the Sedona Series provides beautiful and affordable treatment table options for a broad range of customers. Crafted from beautiful Hard Maple, the Sedona Salon stationary table comes standard with manually adjustable legs, sturdy hardwood frame and a luxurious, rounded corner flat top. 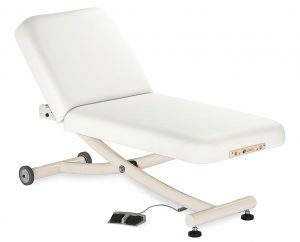 Generously upholstered with our Pro-Plush™ Deluxe 3” cushioning system and covered with our sumptuous yet durable Natursoft™ upholstery, the Sedona Series provides beautiful and affordable treatment table options for a broad range of customers. Shown with accessories: Flex Arms, Neck Roll and Head Pillow. Picture shown is the Pneumatic tilt. The Ellora Vista™ is a stronger and sleeker version of the universally popular Ellora electric lift table, offering the perfect economical blend of beauty and functionality for day spas, medi-spas and resorts. Optional accessories package includes: Flex Arms, Neck Roll and Head Pillow. The Ellora Vista™ is a stronger and sleeker version of the universally popular Ellora electric lift table, offering the perfect economical blend of beauty and functionality for day spas, medi-spas and resorts.